UAB researchers are investigating computer-based speed-of-processing training as a way to help aging patients with HIV boost cognitive performance. Twenty years ago, a patient with HIV was most likely going to die from complications of AIDS. Today, many patients can expect to live a relatively normal lifespan, but emerging statistics show that they are at a higher risk for developing many chronic conditions. Several CFAR investigators have taken up the challenge. David Vance, Ph.D., a researcher in the UAB School of Nursing with a background in developmental psychology, has published several studies examining the cognitive effects of aging with HIV. He is now testing potential therapies. Long-term studies show that “most people with HIV will experience at least some cognitive deficits, and many people will experience serious cognitive deficits,” Vance says. While the exact reasons are still being teased out, it is clear that both HIV and the medicines used to fight it are responsible. New research by Vance and fellow investigators in UAB’s Roybal Center for Research on Applied Gerontology has pinpointed another brain booster: computer-based speed-of-processing training. UAB researchers have already shown that training can increase the speed of processing in the brains of senior adults. 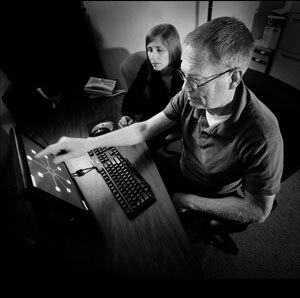 Researchers have focused on a measure called useful field of view (UFOV), which tracks how well someone can respond to objects outside the direct line of sight. “As people age, their UFOV shrinks,” Vance says. “That’s really bad news for driving.” But UAB research shows computerized UFOV training “can bring improvements after just 10 sessions, and the effects last for years,” Vance says. And the training appears to be just as effective in aging adults with HIV.